The Inter-Mountain photos by Joan Ashley Splash, a pinto pony, gets fitted for her unicorn horn. SUGAR GROVE — From a potential slaughter house ending, Splash, a pinto pony, has risen to stardom as a winning show jumper and unicorn model, thanks to the foresight of an experienced horse trainer. Splash was an hour away from being included on a killer truck when Amanda Kiser saw her potential and bought her for a bargain price. 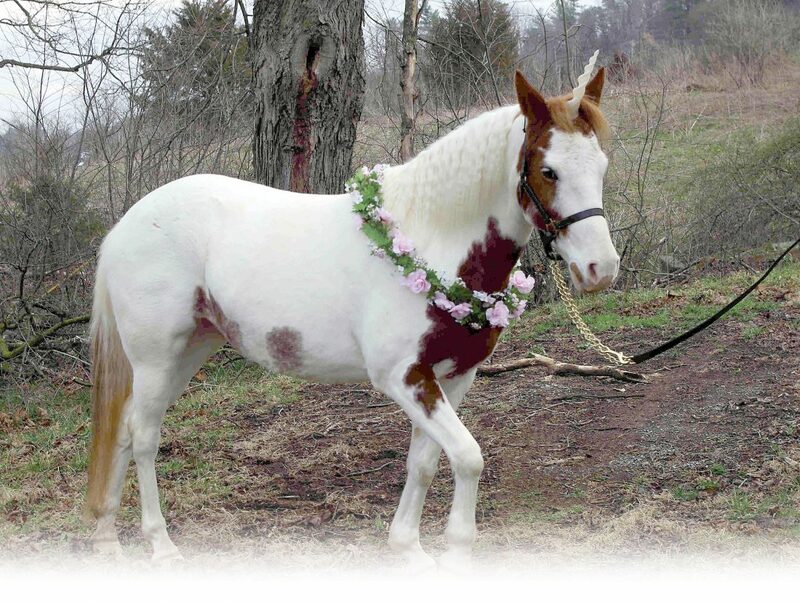 “She was being used as a trail riding mount, and they claimed her unsafe. They just didn’t know how to train her. It was a lack of knowledge, and Splash took advantage of them,” Kiser said. Working with Splash for about a year, Kiser discovered she loves to jump. “Last year she got reserve high point jumper after winning most of her qualifying jumping classes. She sails over 2’6” fences,” Kiser said. “I love working with her and have fallen in love with her. But I’m too large to ride her to her potential, so sadly, she’s for sale to a good home. 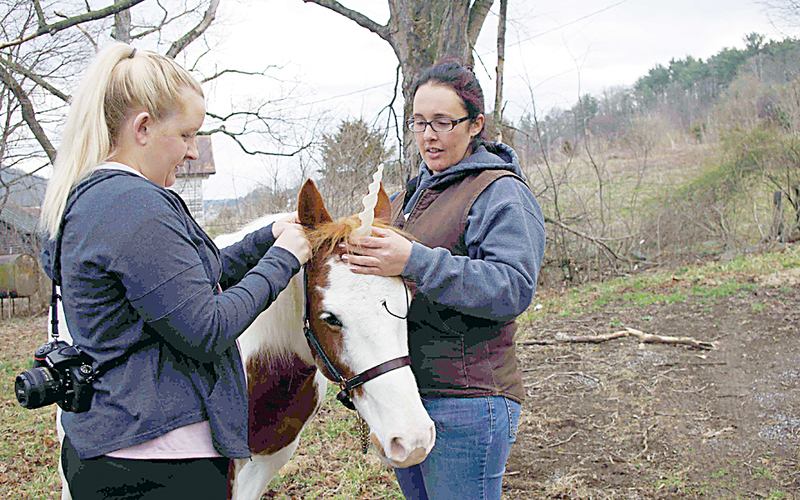 She’s calm and quiet, but still has that delightful pony temperament,” Kiser said. Good temperament was proven last Saturday as Splash stood quietly while Kiser and Samantha Puffenbarger positioned a spiral “unicorn horn” tied to a leather halter. After several slip-ups over her ears, the horn stayed comfortably in place, and Splash was ready to meet little maidens anxious for the enchantment of touching and stroking a “real” unicorn. Next Sunday from 9 a.m. to 7 p.m. Splash will continue to pose with children wanting to adore a unicorn. Puffenbarger will provide photos memorializing their magical meeting. Appointments can be made at myspphotos@gmail. If she doesn’t shake off her unicorn horn, Splash will be a colorful model to delight her small admirers and has won her right to a productive life.